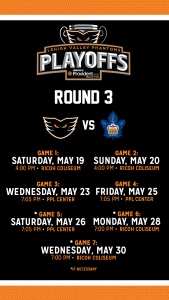 Lehigh Valley, Pa. – The Lehigh Valley Phantoms, proud AHL affiliate of the Philadelphia Flyers, are pleased to announce the schedule for their third round, best-of-seven Eastern Conference Finals series with the Toronto Marlies, AHL affiliate of the Toronto Maple Leafs. The Phantoms, who claimed the Atlantic Division Championship, eliminated the Providence Bruins in four games (3-1) in the opening round of the 2018 Calder Cup Playoffs and are coming off a five-game series victory (4-1) over the Charlotte Checkers in the Atlantic Division Finals. Meanwhile, the North Division Champion Marlies eliminated the Utica Comets in five games (3-2) in the first round before completing a four-game sweep (4-0) of the Syracuse Crunch in the North Division Finals. With 112 points during the regular season, Toronto is the only team in the AHL to finish the year with more points than the Phantoms. As such, the Marlies will host Games 1 and 2 on Saturday, May 19 and Sunday, May 20, respectively before the series shifts to downtown Allentown. The Phantoms will host Game 3 on Wednesday, May 23, Game 4 on Friday, May 25 and, if needed, Game 5 on Saturday, May 26. All games at PPL Center will begin at 7:05 p.m. If necessary, the best-of-seven series will then return to Ricoh Coliseum in Toronto for Games 6 and 7. 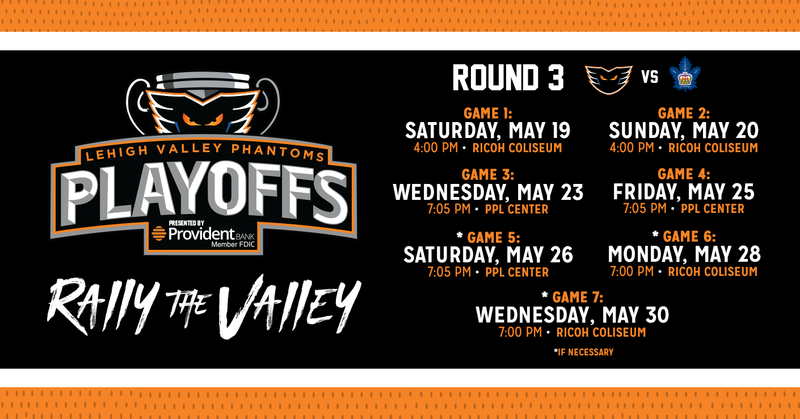 Please see below a complete breakdown of the Phantoms’ third round schedule. The Phantoms posted a 0-1-1 mark head-to-head against Toronto during the regular season as Lehigh Valley was handed a 5-1 setback to the Marlies on November 5 at PPL Center before a 3-2 shootout decision on January 5 at Ricoh Coliseum in Toronto. The Phantoms finished the 2017-18 campaign with an impressive 27-6-5 record at PPL Center and are 3-1 in downtown Allentown this postseason. Meanwhile, Lehigh Valley was 20-13-5 on the road during the regular year and has posted a 4-1 record in playoff road outings. In the midst of the club’s 12th postseason appearance in franchise history, the Phantoms have captured two Calder Cup Championships (1998, 2005) and carry a 75-54 overall mark in 129 career AHL postseason outings. This is the fifth regular season division title in franchise history and the team’s first since arriving in the Lehigh Valley. Playoff strips, 10-game flex packs, and single game tickets to the 2018 Calder Cup Playoffs are on sale now! The Phantoms are once again be hosting an Orange Out during each home playoff home this season. Fans are encouraged to wear orange to each and every postseason game at PPL Center as we create the best and most exciting home-ice advantage in the league.